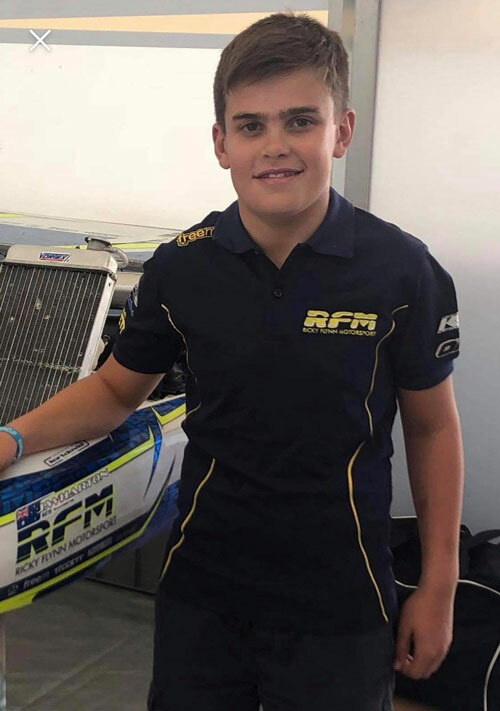 James Wharton did not make the OK-Junior final at Lonato overnight, a totally unjust result considering how well he’d run in qualifying and the heat races. The Melbournian was ranked 1st of 81 drivers after the heat racing and sat on pole for Pre-Final ‘A’. Having led at the start, he fell back into the gaggle of karts competing for third through seventh before contact put him out of the event. The DNF meant he did not transfer to the Final. “Didn’t end the way we planned” he wrote on social media. “We led (pre-)Final A at the start and fell back to a battle with 3rd-7th and than got spun. Christian Mansell (OK-J) and Cody Maynes-Rutty (60Mini) also made it through to contest their respective pre-finals, but neither made the cut to the Final stage. James Wharton (FA/Vortex, RFM) – Q 5th (Group E). Heat results – 1, 2, 1, 3. Ranking 1st. Pre-Final – 30th/DNF (eliminated). Marcus Flack (Energy/TM, Energy Corse) – Q 47th (Group B). Heats – 29, 15, 30, 28. Ranking 69th (eliminated). Christian Mansell (Exprit/Vortex, Lennox Racing) – Q 80th (Group E). Heats – 21, 28, 21, 16. Ranking 57th. Pre-Final – 25th (eliminated). Cody Maynes-Rutty (Parolin/TM, Autostar) – Q 45th (Group C). Heats – 18, 7, 14, 11, 3. Ranking – 23rd. Pre-Final – 25th (eliminated). 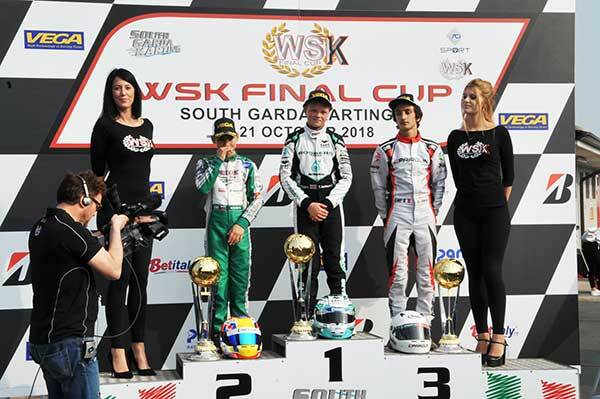 Three racing weekends separate the one just ended in Lonato to the closer of Adria on November 25th during which the WSK Final Cup’s contenders will put on a fierce competition on track. Next round is at Castelletto, November 8-11. The first win in OK went to the Italian Lorenzo Travisanutto (KR-Parilla-Bridgestone), who got the full haul in this first round: he won all the heats, Prefinal A and then claimed the win in the Final by a good margin. The Dutch Kas Haverkort (CRG-TM) tried to challenge him. He recovered up to the victory in Prefinal B and then tried to chase Travisanutto. Haverkort eventually had to settle for P2, as the Italian Luigi Coluccio (BirelArt-TM) tried to attack him staying in his slipstream. Following the win from Haverkort to Coluccio (above, the three drivers on the podium), Travisanutto is currently leading OK at 90 points. The very young Alex Powell (Energy-TM-Vega) came from Jamaica resolute to shine: he managed to do exactly this after beating the young karting promise Brando Badoer (Parolin-TM), who has battled for the victory all the way to the flag of the Final. The two exchanged on top of the charts for the whole weekend, starting from qualifying heats up to Prefinals, when they claimed one win each. 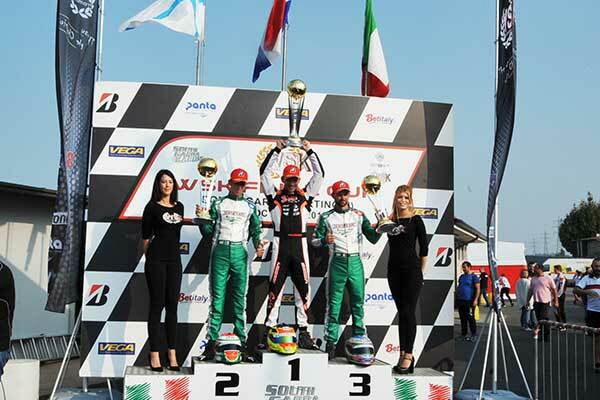 At the start of the Final, Powell was quick to take the lead, while Badoer had initially to concede the second place to the Brit Coskun Irfan (Parolin-TM). The young Italian bounced back in the second half of the race and found his way past Irfan, when Powell was too far away though. The classification of the first round rewards the results scored in the heats, Prefinal and Final and currently sees Powell on top at 90 points. Above, the podium of 60 Mini. The British driver Taylor Barnard (KR-Parilla-Vega) had Prefinal-A as the turning point in his quest to the victory in OKJ. He had to recover following some results in the heats that did not place him to the front of the pack. The victory in the Prefinal allowed the Brit to get a pole position start in the Final and Taylor did not miss the chance to keep the lead all the way through. The race put in by the Russian Nikita Bedrin (Tony Kart-Vortex) was also quite good and, after a sudden hiccup that slowed him down in the heats, he managed to recover up to P2 in the Final. 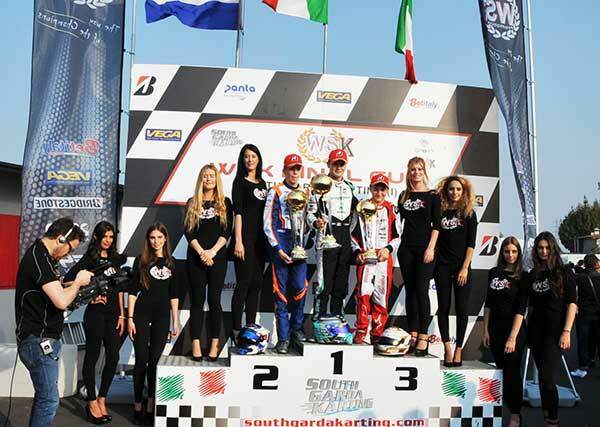 Bedrin had to face the challenge of his fellow countryman Kirill Smal (Tony Kart-Vortex), who eventually was third, following a penalty handed to the Italian Gabriele Minì (Parolin-TM) after the race, due to his racing behaviour. In the provisional standings, Barnard is the leader with 84 points. Above, the OKJ podium. Bas Lammers (SodiKart-TM-Bridgestone) managed to win KZ2 setting a pace that took him to the win in all the races he run in Lonato: namely, qualifying heats, Prefinal and Final. The Dutch only struggled a bit towards the end of the Final, when the strong Finn Simo Puhakka (Tony Kart-Vortex) tried to steal the win from him. 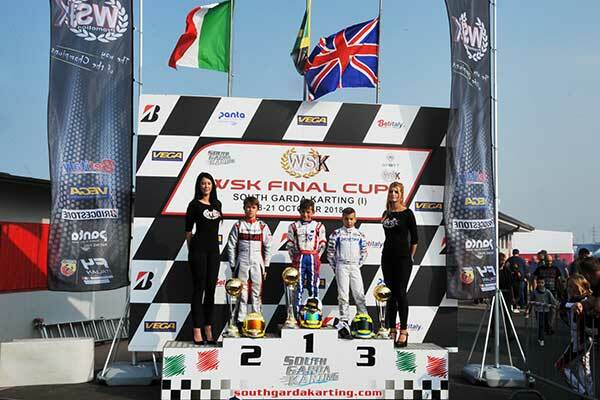 Lammers managed to fend him off even when the Italian Marco Ardigò (Tony Kart-Vortex) slid in the fight for the top. The three (above, on the podium) crossed the finish line in this order, which allowed Lammers to take the lead of the classification at 90 points.